Easyjet will be flying from London to Aqaba with airfares starting from a little more than 41 British Pounds. This is excellent news for the travel and tourism Industry in Jordan. The Jordanian Ministry of Tourism and Antiquities and the Jordan Tourism Board are glad to announce that one of the world’s leading carriers will begin flying to the Kingdom starting winter of 2018. The announcement from easyJet, made on Thursday the 9th of August, stated that the new route from London will commence on Saturdays with a frequency of one flight per week through to the 23 March. Tickets are already on sale on the easyJet website with prices from £41.98 one way and are expected to bring in several thousand new tourists a year. 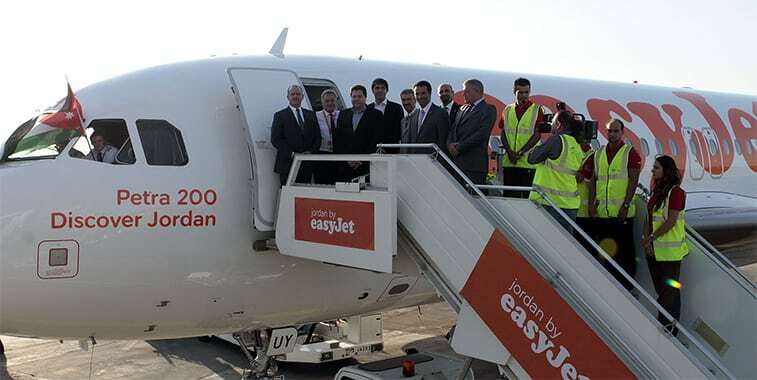 The launch of new non-stop flights from London Gatwick to Aqaba in Jordan, announced today by low cost airline easyJet, will open up one of the Middle East’s most exciting destinations to travellers from the UK. The historic Port City on the Red Sea’s Gulf of Aqaba boasts beaches, premier snorkeling and scuba diving, and unbeatable access to Jordan’s south, where highlights include the famous ancient city of Petra and the spectacular desert landscapes of Wadi Rum. Aqaba has been transformed in recent years with billion-dollar development in two new resorts – Ayla and Saraya Aqaba – that welcome holidaymakers with new four and five-star hotels, activity experiences, a marina, restaurants and beach clubs. With average high temperatures reaching above 20 degrees during the winter months, and additional developments including Jordan’s first 18-hole Championship Golf course, a professional-quality wake-boarding park, and the region’s first water park, Aqaba is fast becoming the region’s leading winter sun destination. Visitor numbers to Jordan from the UK have grown in recent years following the launch of the Jordan Trail, a nation-long walking trail showcasing the diverse range of experiences the country has to offer, and the resurgence of consumer confidence in the destination. UK visitor numbers increased by 6 per cent in 2017, compared to the same period in 2016. Aqaba is located in the far south of Jordan, less than five hours flying time from the UK. Aqaba International Airport is situated just 20 minutes from the centre of Aqaba, with both new resorts an equally short journey away. The red-rose city of Petra, one of the seven modern wonders of the world, is just a two-hour drive, making it an accessible day trip, while the Unesco World Heritage landscape of Wadi Rum is even closer, meaning travellers can combine relaxing days with exploring some of the world-famous experiences Jordan has to offer. The service commences on the 10 November on Saturdays with a frequency of 1 flight per week through to the 23 March. Tickets are already on sale on the easyJet website with prices from £41.98 one way.